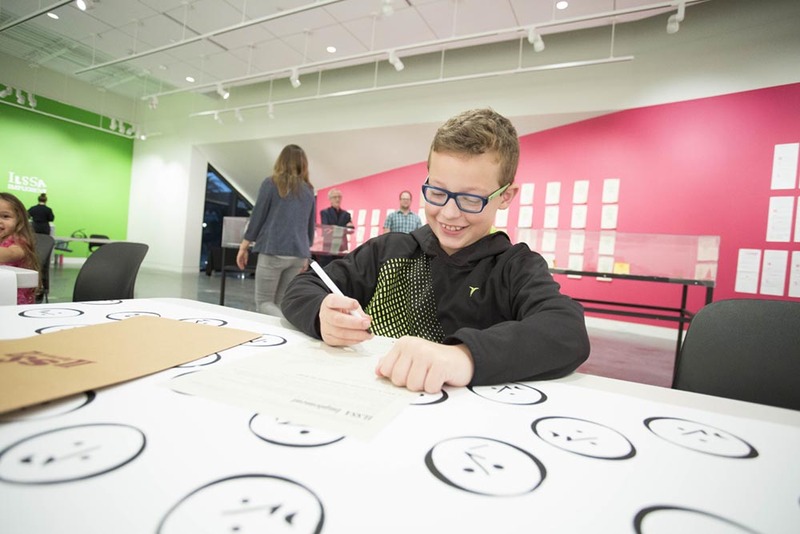 ILSSA investigates the conditions, qualities, and experiences of impractical labor by organizing projects that help members explore and reflect upon their process. Frequently these projects iterate into exhibitions and publications. ILSSA Members Local 205 Shop RG, Local 139 Shop GU, and Local 717 Shop WP observing the Festival to Plead for Skills. Each year on the seventh day of the seventh month, ILSSA celebrates its own version of the Festival to Plead for Skills. The festival is derived from the Chinese holiday of Qi Xi and the Japanese festival of Tanabata, in which celebrants wish for the betterment of their own craftsmanship. Instead of wishing, the ILSSA festival is a holiday of practicing. Join us each year on July 7th as we observe this holiday by practicing a skill: using a tool, trying a method, honing a technique. For the 10th annual Festival to Plead for Skills on July 7, 2018, ILSSA members everywhere were encouraged to hold space where they were, and invite others to practice alongside them. A potluck practice was held at the ILSSA HQ in Bridgeport, CT. 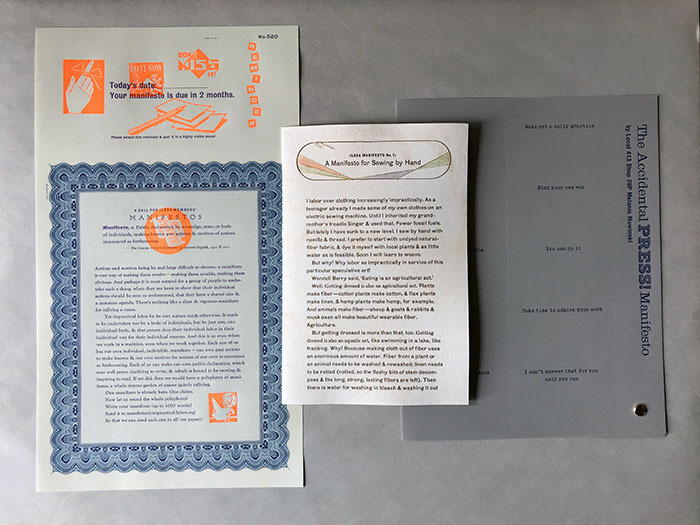 In past years festival observance has been shared via mailed objects, print publications, and on the ILSSA website; this year, documentation of practice was shared on Instagram. Follow along to see what our members were practicing! ILSSA Members at the 3rd Annual Group Residency (June 7-10, 2018) at North Mountain Residency, Hedgesville WV. 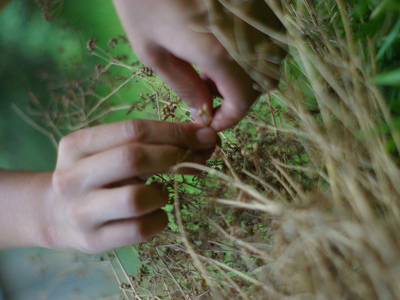 The ILSSA Group Residency is an opportunity for self-study, exploration, and redirection. Inspired by feminist sociologist Kathi Weeks, we offer the ILSSA Group Residency “not so that we can have, do, or be what we already want, do, or are, but because it might allow us to consider and experiment with different kinds of lives, with wanting, doing, and being otherwise.” As Weeks suggests, the ILSSA Group Residency is an example of “collective autonomy,” offering “freedom as the time and space for invention,” (The Problem With Work). 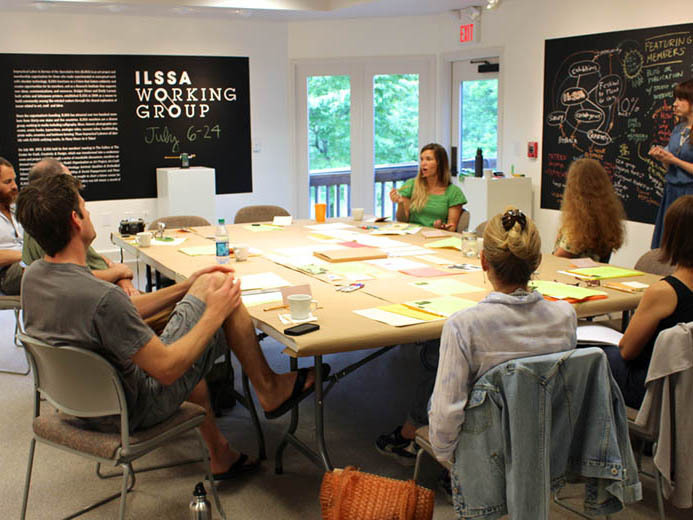 The ILSSA Group Residency is an experiment in living: creating the time, space, and place to imagine new ways of being. Consisting of skillshares, readings, reflection, walks, individual practice, cooking, shared meals, meditations, and conversations, the Residency creates an opportunity to reimagine and redirect our lives after the Residency. All members are invited to attend. Space is limited, and filled on a rolling basis. We are grateful to North Mountain Residency, founded by ILSSA member Local 503 Shop JL John Labovitz, for the perennial invitation to convene in this beautiful rural setting. Curious to learn more about our most recent residency? Check out the 2018 program! 2018 was also the inaugural year of the experimental ILSSA Family Residency. Following the Group Residency, ILSSA Co-Operator Local 347 Shop FS Bridget Elmer and Local 917 Shop SO Sheryl Oring brought their daughters to North Mountain to join Co-Operator Local 917 Shop RC Emily Larned for an additional week of shared meals, collaboration, and conversation. ILSSA Implement at VSW, Rochester, NY. As Many Hours As It Takes! at Stulberg Gallery, Ringling College, Sarasota, FL (FL photos by Nancy Nassiff). 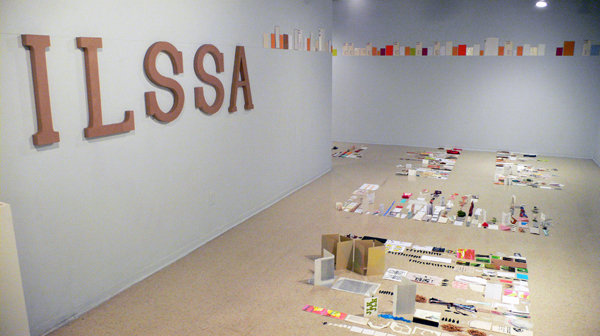 ILSSA Implement at Hunt Gallery, Webster University, St. Louis, MO. ILSSA Implement, which developed out of the ILSSA Hands & Tools exhibition (Asheville, NC, July 2013), is a participatory art project that explores & expands the potential of the toolkit, inviting individuals to share what they deem to be essential tools for living. 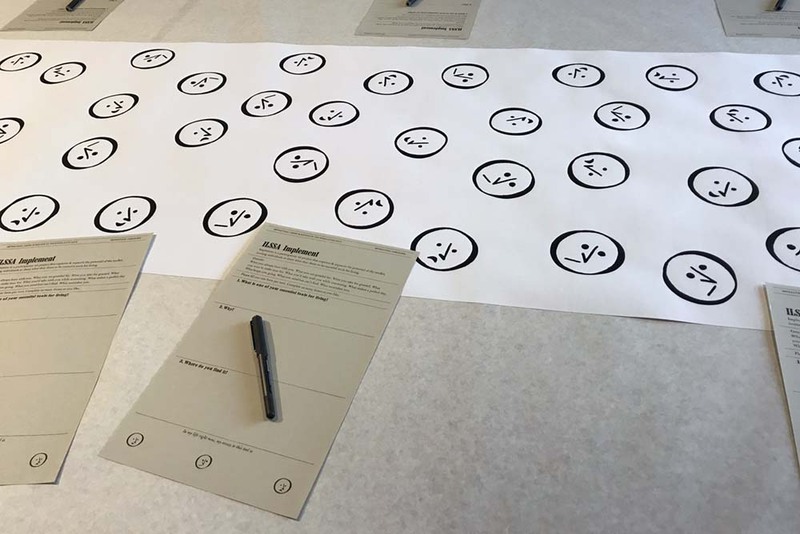 Developed at the fall 2017 residency and exhibition ILSSA Implement at Visual Studies Workshop (Rochester, NY) and activated again at ILSSA's 10 year retrospective As Many Hours As It Takes! 10 Years of Impractical Labor at Stulberg Gallery, Ringling College (Sarasota, FL) in 2018, Implement was the first ILSSA project to be completed by the general public before ILSSA members. 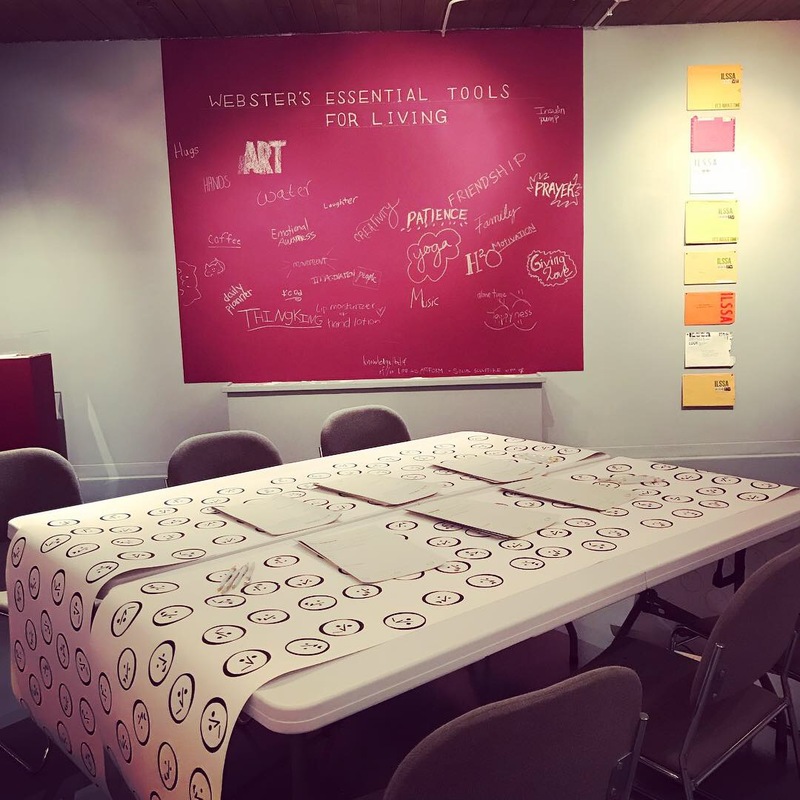 Implement forms were sent to ILSSA members in the May 2018 Quarterly, and members' completed forms were exhibited at the Hunt Gallery, Webster University (St. Louis, MO) from November 16, 2018–January 5, 2019 as as new forms were solicited from the Webster community. 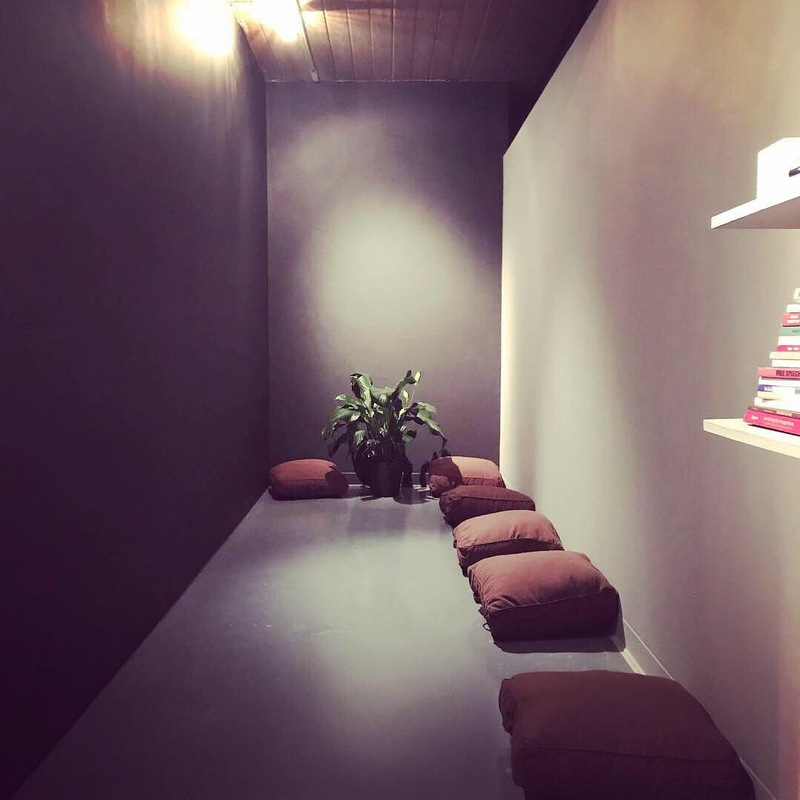 In response to the collected ILSSA member forms to date, this version of the show features a contemplation room for meditation and reflection, featuring a take-a-book / leave-a-book shelf, and a helpful plant. The call for member manifestos, and manifestos #1 & #2. ILSSA manifestos #3-5. #6 in process, summer 2018. In 2015, all members were invited to write their manifestos as an opportunity to recommit to their practice. Each submitted member’s manifesto would be published by ILSSA and sent to every other member, inviting reflection, analysis, and action. Three years later and counting, the ILSSA Manifesto Project takes on new urgency. One of the many difficulties of living in the Trump era is, to borrow an expression from German philosopher Ernest Bloch, the experience of “the narrowing and diminishing of reality.” Frantically struggling to get back to where we thought we were, it seems impossible to imagine something spectacularly more than what we thought we had. 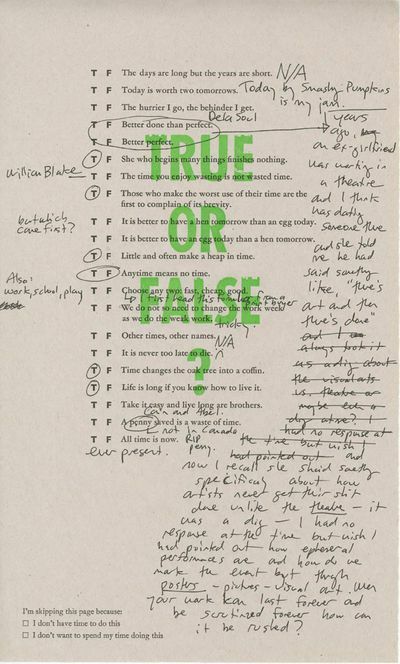 Writing a manifesto, Kathi Weeks reminds us, offers an opportunity to critique, to imagine, and to act, to widen and expand the possibilities of reality. Local 828 Shop ME Maria Epes, author of the forthcoming ILSSA Manifesto #6, writes: The act of writing a manifesto required my belief that it matters to have beliefs. The discipline of structuring my thoughts in a logical and concrete way was an act of faith. It created the framework for general feelings and inklings to become specific. Writing these ideas down made me believe that I did actually believe them. 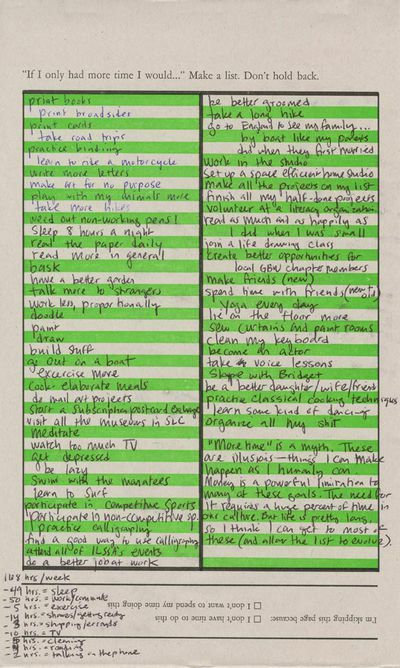 And I felt gratitude for the suggestion to write my own manifesto; I would never have thought to do that. Explaining yourself also introduces you to yourself; it helped me define my small place and time in the sun. The ILSSA Manifesto Project is ongoing; currently #6-8 are in development, and will be distributed in future Quarterlies. All members are encouraged to submit. ILSSA Making Time self-test of ILSSA Member Nike Desis. This project interrogates the assumed plasticity of time, especially as it relates to an individual person. We posit that for most of us, our internal, natural time cycles are governed by something stronger than cultural expectations. Moreover, we believe that treating all time as equal can be as potentially harmful as not thoughtfully using the time at all. What is your best time for impractical labor? For answering emails? For tackling household chores? If we save our most alert time for our most valued activities, and our lowest times for the necessities of life that do not require us to be at our best, will we optimize our experience of time? Our process of living? Our life? 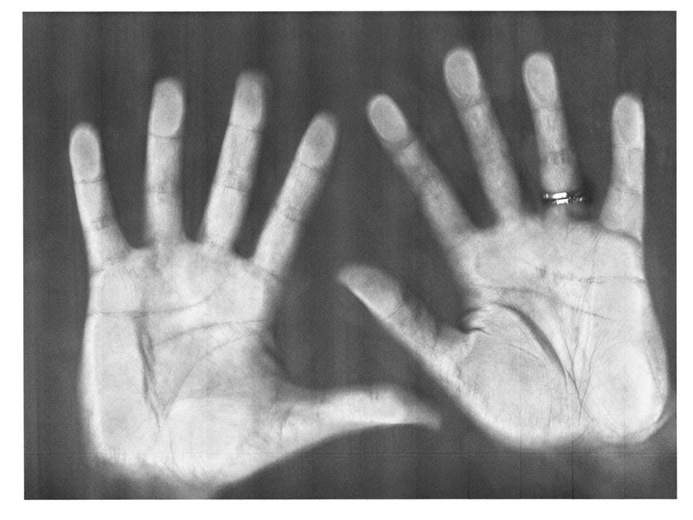 By performing a brief experiment, using self-observation and self-analysis, this project helps ILSSA members characterize their personal time cycles: their individual chronobiologies. 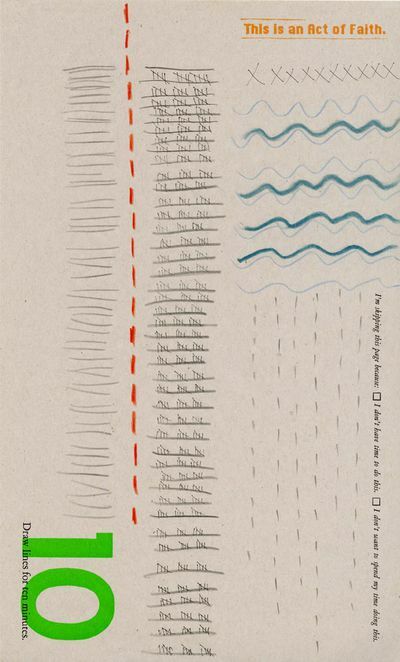 By charting—without judging—the ebb and flow of energy, whether creative, cognitive, physical, or social, our hope is to help our members understand how to better use their time. 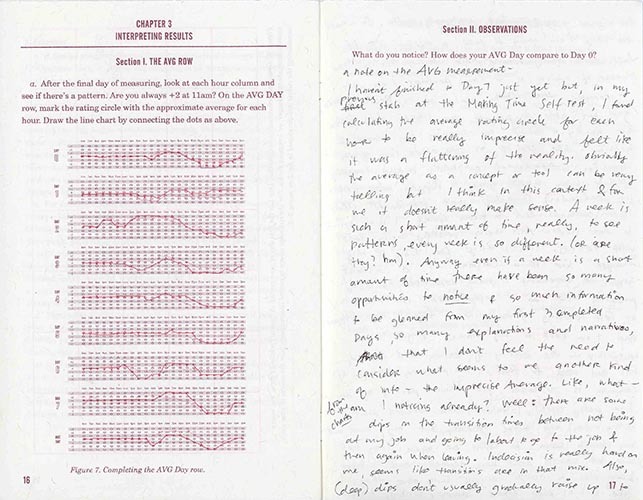 Above: Pages from members' completed ILSSA It's About Time workbooks. 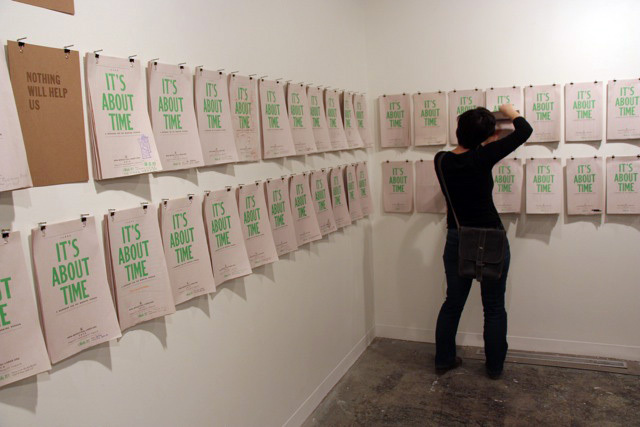 Below: ILSSA It's About Time installed at Coburn Gallery, Colorado College, 2014. Time. What is it? How do you save it? How do you spend it? Can you make more of it? 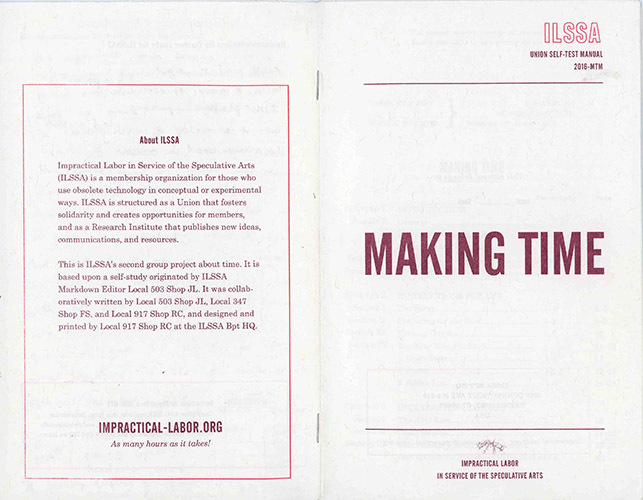 ILSSA It's About Time: A Workbook for the Working Person, asks these questions and 24 more. 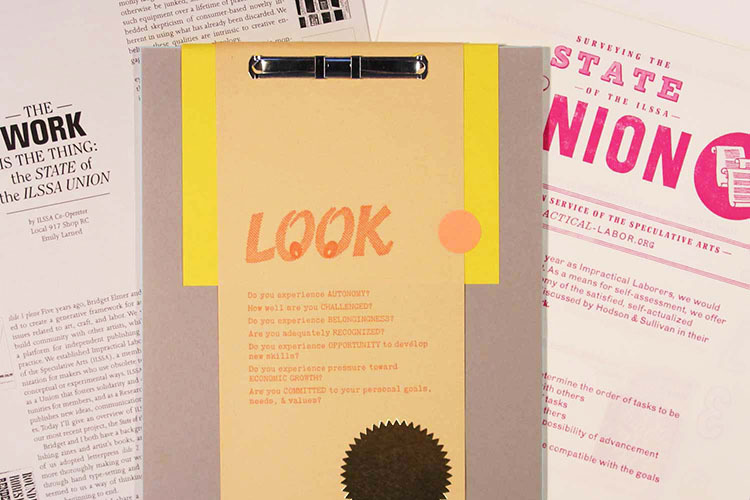 A project that came out of discussions at the 2013 ILSSA Working Group meeting, this workbook was written, designed, and letterpress printed by Local 347 Shop FS Bridget Elmer, Local 719 Shop NLP Aaron Cohick, and Local 917 Shop RC Emily Larned. 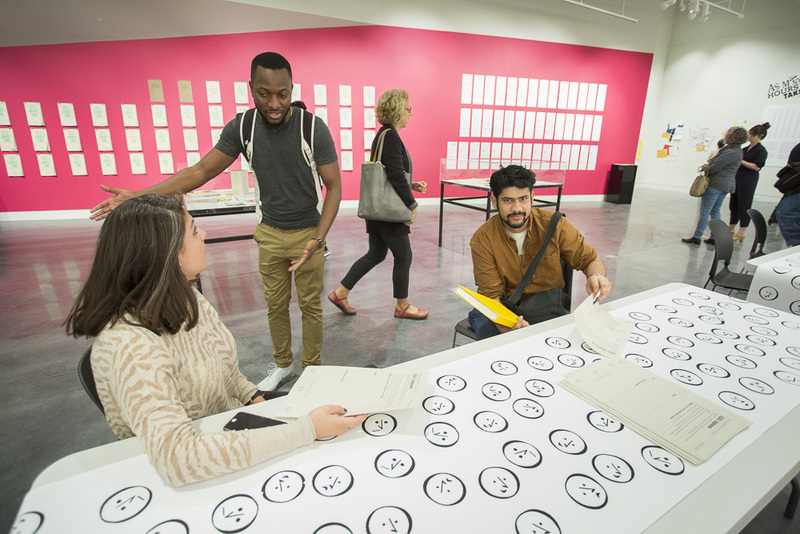 It was developed in response to an invitation to exhibit at Colorado College's Coburn Gallery. View the exhibition guide for a list of participating members. 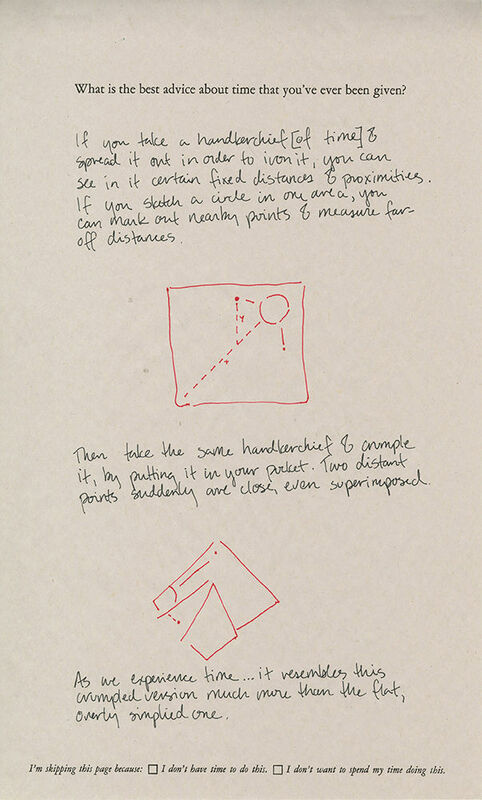 ILSSA members received the 28 page letterpress printed workbook in the January 2014 Quarterly; 50 members participated by visually and verbally exploring the questions during the month of February: one page per day. 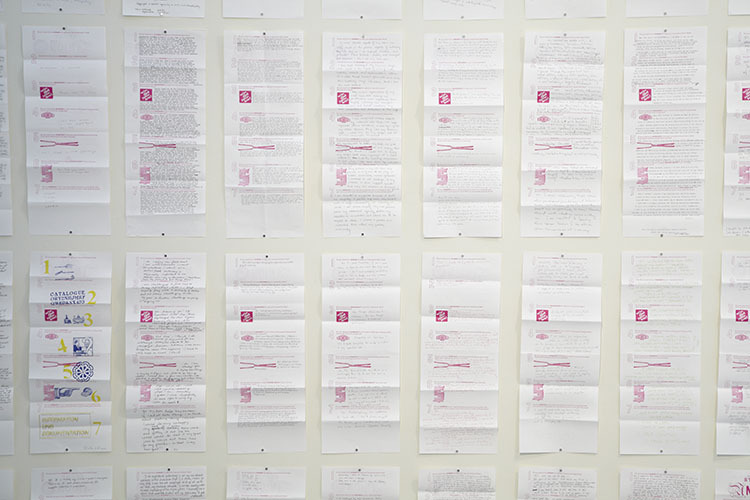 In the exhibition at Colorado College, scans of eight of the same page from every workbook were hung in grids on the wall, displaying every member's response to the same prompt. 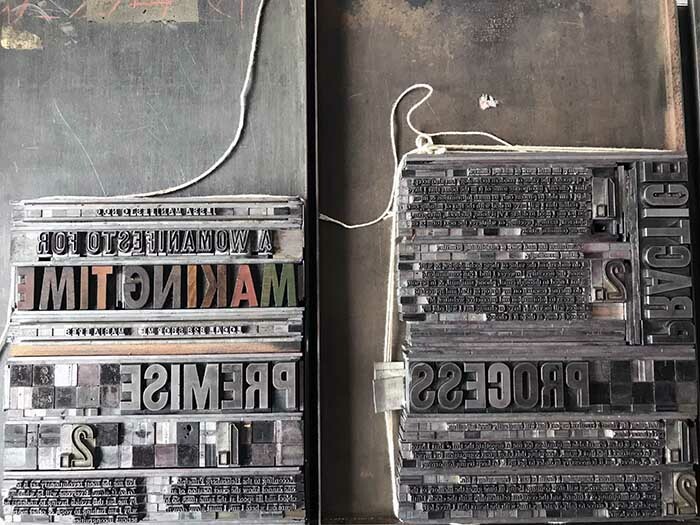 In 2015, the exhibition of ILSSA It's About Time workbooks traveled to Asheville BookWorks, NC and PRESS! at Massachusetts College of Liberal Arts (MCLA), North Adams. 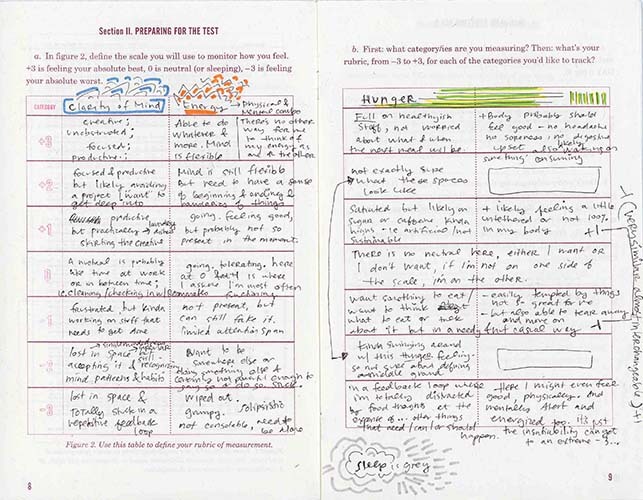 A compilation book containing facsimiles of two prompts from all participants was made by Publication Studio at Williams College Museum of Art; copies were given to all participating ILSSA members (along with a fresh copy of the It's About Time workbook in return for the completed one). 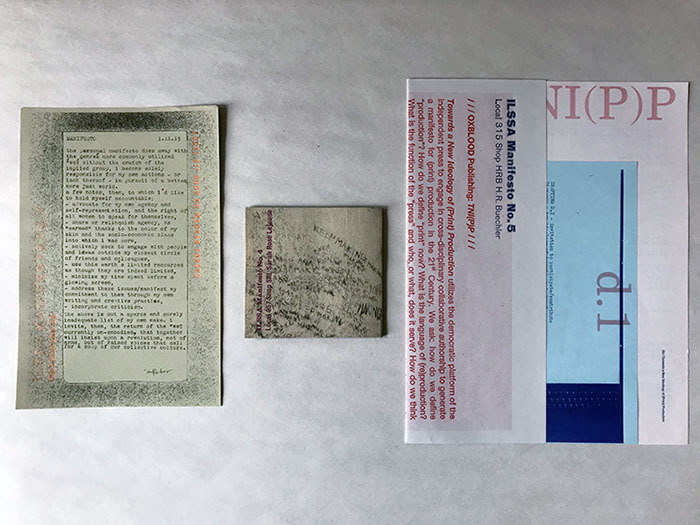 This project was also shown at a group exhibition at the Museum at Florida State University, Tallahassee (2016), and displayed in ILSSA solo exhibitions at Visual Studies Workshop, Rochester, NY (2017) and Ringling College, Sarasota, FL (2018). The invitation to the Convergence; Local 850 Shop LL installing vinyls; ILSSA Working Group meeting and exhibition at The Center for Craft, Creativity & Design (photo by Marilyn Zapf); the hands of Local 347 Shop FS from the Hands & Tools exhibition at Harvest Records; setting type on a curve for the Festival to Plead for Skills; the ILSSA Working Group Report. 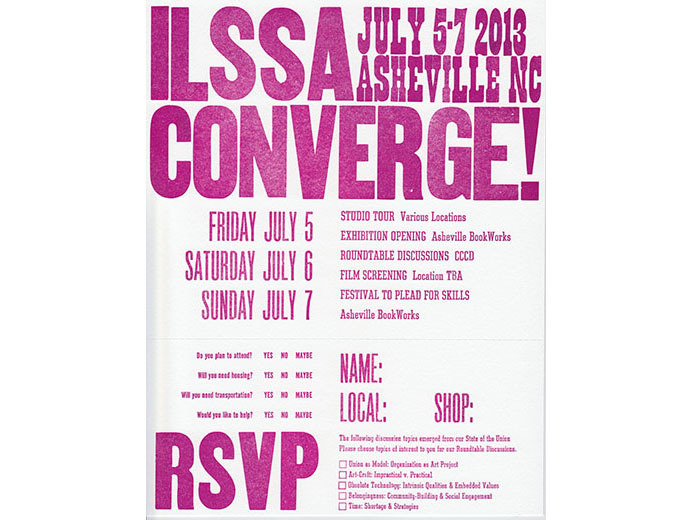 Prompted by members' thoughtful participation in Surveying the State of the ILSSA Union, all ILSSA members were invited to Asheville, NC for a July 2013 convergence. The ILSSA Convergence included an open studios walking tour, a members' meeting with targeted roundtable discussions, the opening of three exhibitions (at The Center for Craft, Creativity & Design; Asheville BookWorks; and Harvest Records), a film screening, The Heroines of Handcrafted Cinema, curated by Mechanical Eye Microcinema; and a shared observance of the 5th Annual Festival to Plead for Skills at Asheville BookWorks. All events besides the members' meeting were open to the public. View the complete schedule here. 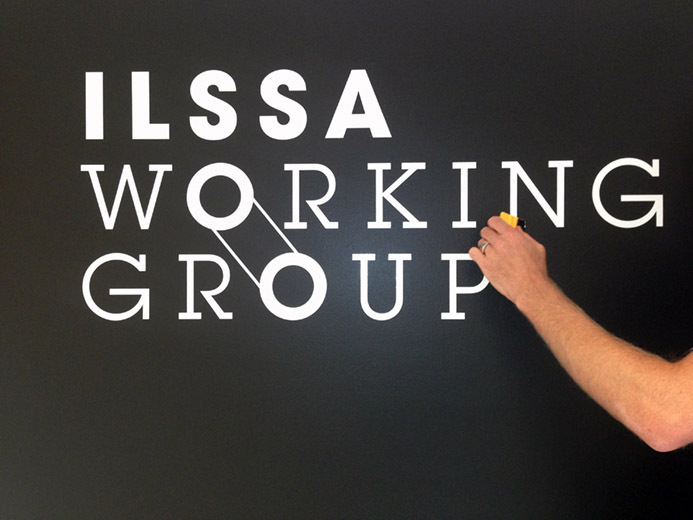 After the Convergence, the events were documented and shared with all members as the ILSSA Working Group Report. 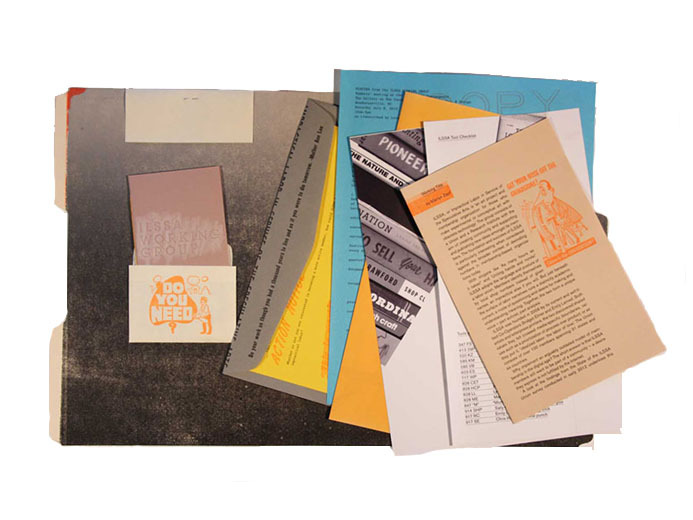 Published in 2018, Hands & Tools documents the exhibition at Harvest Records, providing context for the ongoing Implement project. 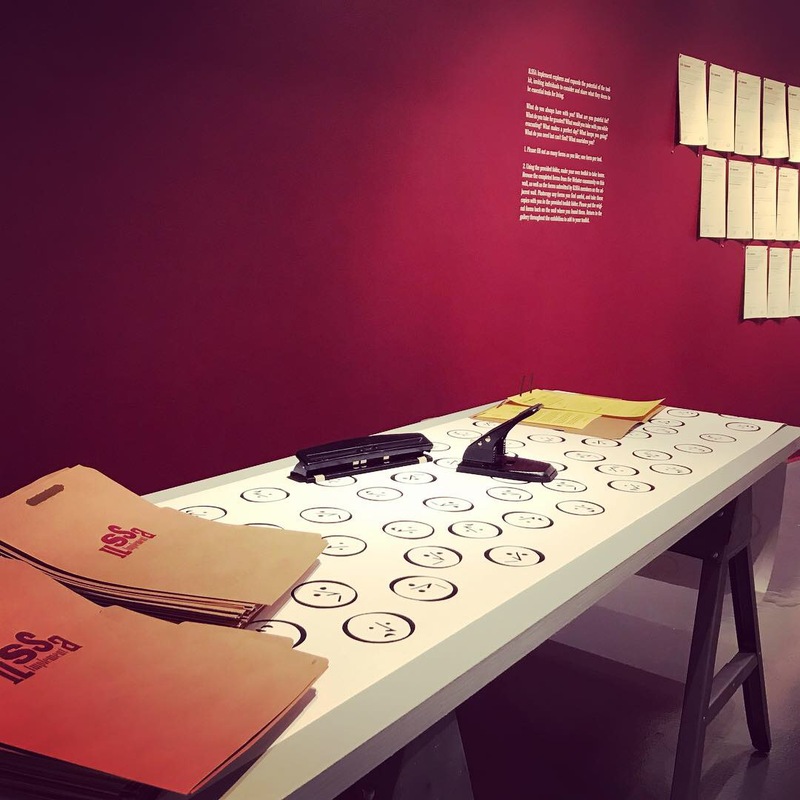 The original surveys as installed at A+D Gallery, Columbia College Chicago; the State of the ILSSA Union Report. Do you experience AUTONOMY through your impractical labor? How well are you CHALLENGED? Do you experience BELONGINGNESS? Are you adequately RECOGNIZED? Do you have the OPPORTUNITY to develop NEW SKILLS? Do you experience pressure toward ECONOMIC GROWTH? Are you COMMITTED to your work because it is aligned with your personal GOALS, NEEDS, and VALUES? What are your GOALS, NEEDS, and VALUES? 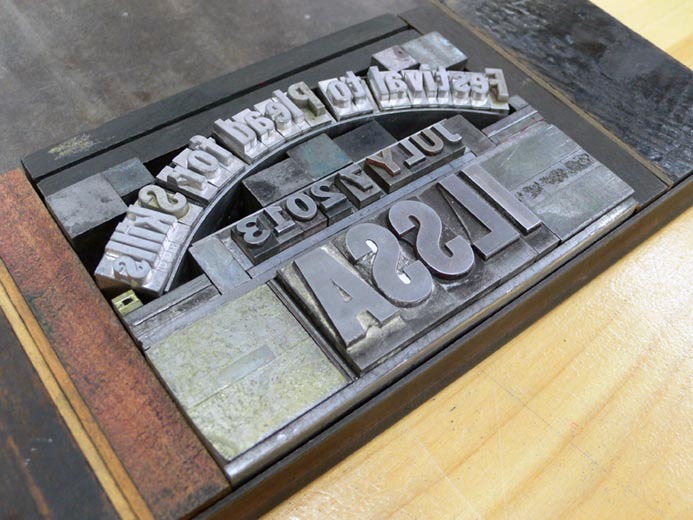 In early 2012, the above questions were posed in the form of a letterpress printed survey sent to all ILSSA members, asking them to assess their working conditions as impractical laborers. The survey responses were compiled into the State of the ILSSA Union Report, and returned to all participants; these responses also became the basis for the ILSSA Convergence. 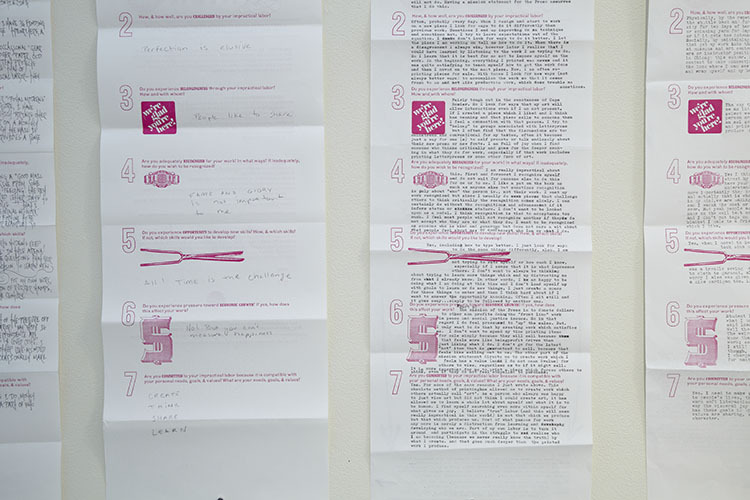 The surveys themselves have been exhibited in group shows in Chicago, IL, Salt Lake City, UT, Asheville, NC, and Manchester, NH, and in ILSSA solo shows in Rochester, NY and Sarasota, FL. 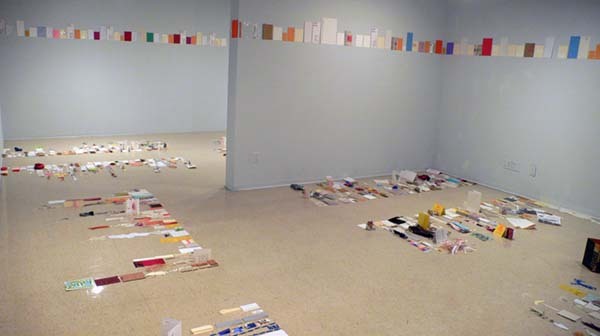 Two installation views of the exhibition at Hammes Gallery, Saint Mary's College, and piles of bound envelope books before they were sent back to members. The exhibition ILSSA Every Day Work (January 27 - March 12, 2012, Hammes Gallery, Moreau Center for the Arts, Saint Mary's College, Notre Dame, IN) visually chronicled one full year of impractical labor as practiced by a dedicated group of ILSSA members. 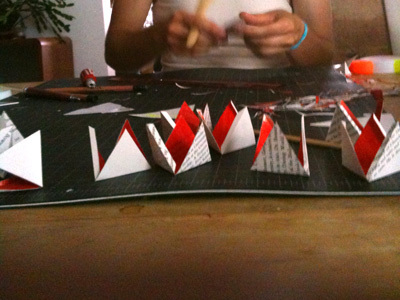 On every day worked in 2011, all ILSSA members were invited to save remnants of their process in a dated envelope. 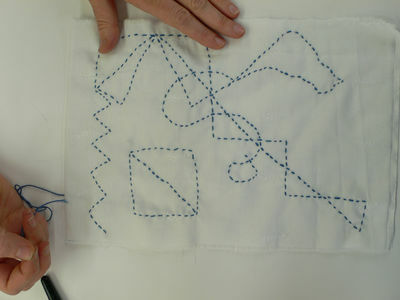 In early January 2012, members sent their envelopes and/or a representative tool to the Hammes Gallery. 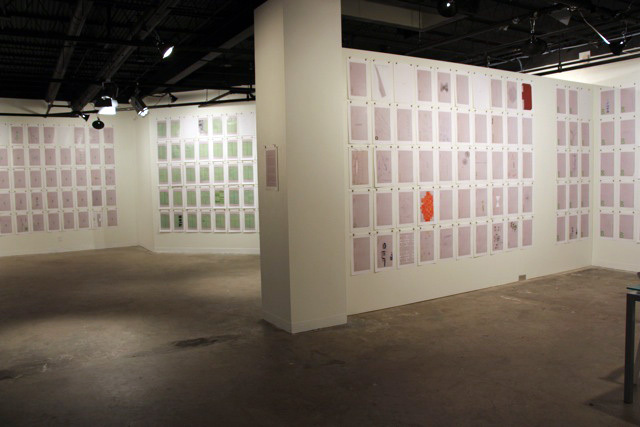 One envelope was posted on the gallery wall for each worked day. 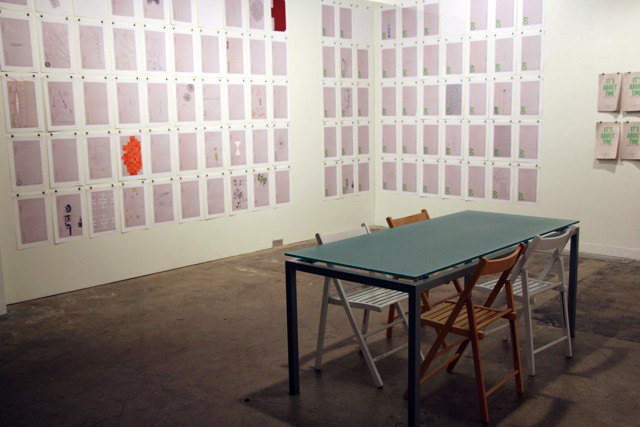 On the gallery floor, the saved remnants were grouped by month, with remnants from each day organized in rows. The exhibition was a material calendar of every day worked by ILSSA union members. Together with the tools, the show provided a glimpse into the nature of such work. View the exhibition guide for a list of participating members. Upon the show's closing, Saint Mary's College students were offered the remnants for their own creative reuse. 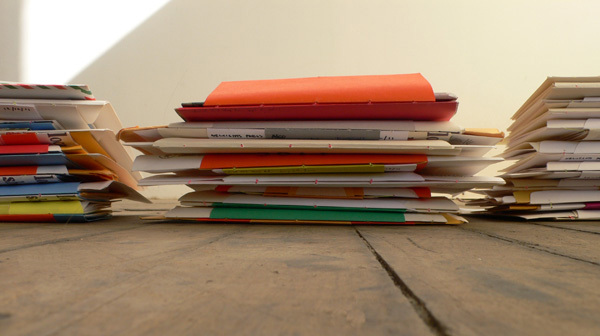 On the 4th Annual Festival to Plead for Skills (July 7, 2012), the ILSSA Co-Operators chronologically collated and bound all submitted envelopes into a collection of 26 books, each book consisting of 2 weeks of envelopes. The books were photographed and then distributed to all participating members.